When the temperature rises, very few things are as comforting as the blast of cold air in your face after punching the MAX A/C button in your car or truck. It’s a little slice of heaven in a sea of heat, but hitting that perfect temperature isn’t a given, so be sure your air conditioning system is working optimally before it’s too late. The air conditioning system in your vehicle is comprised of five primary components – compressor, condenser, accumulator (or receiver dryer), pressure regulating device, and evaporator. These work in unison to create the cool, refreshing air that blows into the cabin. The abridged version of the process is that the compressor compresses Freon to create a high-pressure, high-temperature gas. The condenser cools it somewhat to create a high-pressure liquid, which then flows through the accumulator to drop off any excess moisture before heading to the expansion valve. The expansion valve creates a low-pressure, low-temperature gas which then passes through the evaporator before heading back to the compressor to begin the process again. The cold air you feel coming through your vents is actually hot air being blown over the evaporator and into the cabin. So when should you get your A/C checked? The obvious answer is when your car stops pumping out cold air. If you find that your car doesn’t cool down as much or as quickly as it used to though, it might be a sign that there’s an issue. This could be a small leak or something more serious. You don’t want to be stuck sweating in your seat on a brutal summer day, so spring is the perfect time to stop into a AAA Car Care center to have your A/C system inspected. The best-case scenario if your vehicle’s A/C isn’t working well is that it just needs a recharge. This involves adding refrigerant (aka Freon) and ensuring that the pressure in the system falls within the proper range. 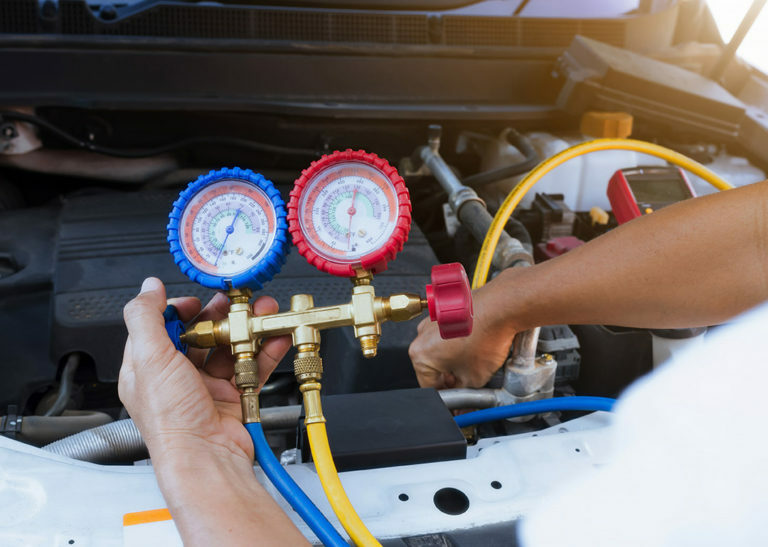 The are several other potential causes of a malfunctioning A/C system though, so be sure to let a AAA Car Care technician diagnose the cause of the concern. Make an appointment today to ensure your vehicle is ready for maximum comfort on the hot days to come!